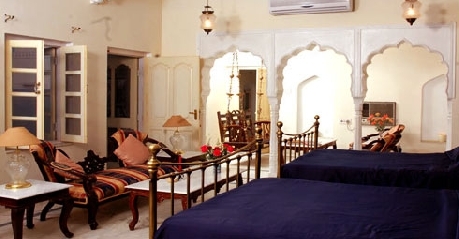 Castle Mandawa was once a fort, it has been converted into a heritage hotel to display its beauty to the world. Without making much modification modern amenities have been incorporated to add additional comfort of the new age guests. The closest airport is the Jaipur Airport which is 168 km and Mukundgarh Railway Station is just 14 Km away. 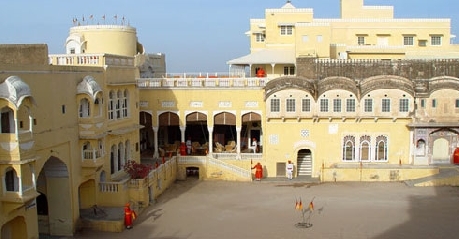 The architecture is astounding and will blissfully take you several years back into the period of the rajas. More predominant are the customs followed even today by the royal family, one example is the striking of the brass gong every hour by timekeeper. The sound of the gong brings curiosity and a smile in the face of the guests. Standard rooms are best suited for double occupancy. The period furniture, high cots and divans like arrangement for sitting gives a different feel of the room and is decked up to best suite the need of the guests. Different rooms provide exotic views to cherish during the stay, its advisable to decide on the choice of view before checking in. A double occupancy room which can accommodate a child or/and infant is spacious even after including all necessary amenities. Complimentary breakfast is included in the room tariff and a sumptuous mix of local and continental menus can be enjoyed. Spacious parking area, room service, swimming pool, phone facility, outdoor activity and beautifully trimmed lawns to relax are the attractions of the castle. Suites are opulent with vintage furniture adding to the beauty of the period. Separate living and bedroom areas make the stay comfortable and a perfect place to loosen up. Beautifully draped curtains, curvature in rooms partitions, paintings that narrate a story, cutlery matching the life style of the rajas always keeps you curious of what is in store for you to explore. 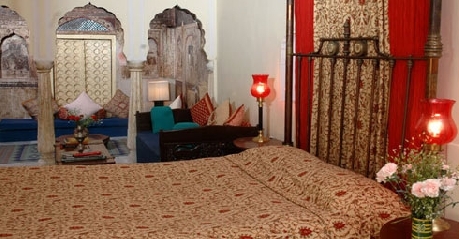 All the rooms are in royal style but the royal suites are pinnacle to it. Lavish décors, spick and span exterior, breathtaking view from the balcony and all at your service are sure to give you a royal experience of a lifetime. Laundry service, ticketing assistance, phone connectivity, internet access are the services at your disposal. Castle Mandawa has an in- house restaurant that serves breakfast, lunch and dinner. 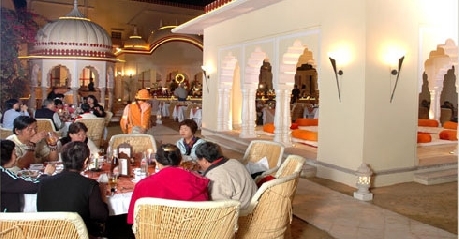 The menu is a mix of continental, Indian and Rajasthani to suite the varied customer base. 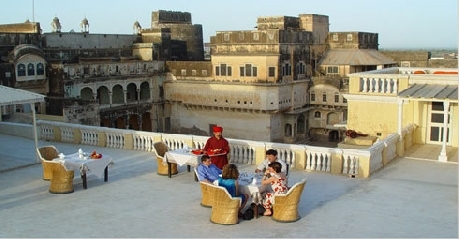 The local food of Rajasthan is a must taste for the flavor and taste is at its best in Mandawa Castle. Conference hall are available and food is catered according to the need of the type of guests attending the meeting. Bar facility is also available to serve the guests.